Since 2009, Bristol Motor Speedway has held a tradition unlike any other on the NASCAR schedule. 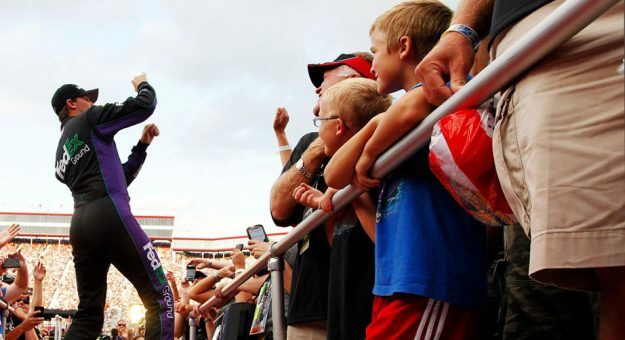 During Bristol’s driver introductions — the pre-race spectacle in which the 40 competitors are individually introduced to the fans before climbing in their race cars — each driver gets the opportunity to emerge from backstage accompanied by a song of his or her choice. Giving drivers creative freedom has (predictably) led to some entertaining moments. At the very least, it’s given us a fascinating look into NASCAR stars’ musical tastes. Over the past eight years, I started to spot trends. Why did it seem like a quarter of the field always walked out to AC/DC? How many times did Kyle Busch choose Raytona 500’s “Rowdy Busch?” Why does Brian Vickers like O.A.R. so much? That’s why I decided it was time to pore through the raw, hard data myself to see what I could find. Are there better uses of time? Probably. But what’s the fun in that? I’ve always wanted to get into investigative* journalism**. So, sit back, relax, and put on your finest wig while we look at some facts and figures about this fine NASCAR tradition. Like showing up to a social occasion wearing the same clothes as somebody else, it’s inevitable that two drivers are going to pick the same song. However, over the years, there have been a few songs that have been perennial hits among NASCAR drivers. Since 2009, 10 drivers have walked out to AC/DC’s “Thunderstruck,” for instance, the most commonly recurring song in Bristol driver introduction history. Here are all the songs ever chosen, sorted by the number of times they were picked. “Thunderstruck” also holds the designation of being the song chosen by the most drivers in a single race, when Dale Earnhardt Jr., Jimmie Johnson, and David Ragan all emerged to AC/DC’s rock hit in the 2009 night race. Holding the “most popular song” title isn’t AC/DC’s only mark of popularity. Looking at the pure number of times an artist was used — across all their songs — AC/DC’s got a runaway lead. Twenty-six times drivers have walked out to Bristol driver introductions while being serenaded by the Australian rock band. That’s more than second- and third-place artists Kid Rock and Motley Crue combined. Over the years, there have been 13 drivers who’ve started each of the 16 Bristol races that were kicked off with musical introductions: Clint Bowyer, David Ragan, Denny Hamlin, Jamie McMurray, Jimmie Johnson, Joey Logano, Kasey Kahne, Kevin Harvick, Kurt Busch, Martin Truex Jr., Matt Kenseth, Paul Menard, and Ryan Newman. Of those drivers, Jamie McMurray and Kurt Busch are the only two to have walked out to a Nickelback song — earning their place on what I’ve dubbed the Nickelback Hall of Shame (sorry, Nickelback fans***). Luckily, nobody’s picked any Nickelback songs since Casey Mears subjected us to “Burn It To The Ground” in the 2011 night race. Mears is also the only driver who chose a Nickelback song more than once. While most drivers pick a different driver introduction song each Bristol race (shoutout to Joey Logano, who’s particularly good at this), there are some who seem to prefer to stick to what they like. That even means, in the case of three drivers, picking the same artist for every single one of their career starts at Bristol. Jeff Burton selected Guns N’ Roses’ “Welcome to the Jungle” a record five consecutive times (2009-2011). Tony Stewart selected Kid Rock’s “Bawitdaba” four consecutive times (2009-2011). David Reutimann selected The Offspring’s “Pretty Fly For A White Guy” four consecutive times he raced (2011-2013). Kyle Busch selected Raytona 500’s “Rowdy Busch” a record seven times. Unsurprisingly, he’s also the only driver to have ever selected the song named in his honor. Here’s a statistically and historically accurate fantasy tip that nobody else is going to tell you: If Brad Keselowski picks a Kid Rock song as his driver introduction song, he’s going to win the race. If he doesn’t pick Kid Rock, he’s not going to win the race. Keselowski picked Kid Rock in back-to-back races: The 2011 night race and the 2012 spring race. He won both races. Those were the only times he’s ever picked Kid Rock, and those were the only times he’s won at Bristol. Busch, of course, scored both Raytona 500 victories, and Keselowski, as noted, notched the two for Kid Rock. So far, history seems to indicate that an artist can only win with one driver. Juan Pablo Montoya picked Smash Mouth’s “All Star” in 2009 (Night). Martin Truex Jr. picked the NAPA Know How jingle in 2010 (Spring). Joey Logano picked “Crank Dat” by Soulja Boy in 2010 (Spring). Brian Vickers picked Shania Twain’s epic “Man! I Feel Like a Woman” in 2011 (Spring) (one of the few times he didn’t pick O.A.R.). Landon Cassill Rick-Rolled the crowd in 2011 (Spring). He also picked the “Sesame Street” theme song in 2016 (Spring). Denny Hamlin entered to V.I.C.’s “Wobble” in 2012 (Night). Kasey Kahne picked a Chumbawamba song in 2014 (Night). In the 2012 spring race, Tony Stewart entered to “How Do You Like Me Now?” by Toby Keith, and in the 2012 night race, he walked out to “How You Like Me Now” by The Heavy. Was there confusion as to Smoke’s selection the first time around? Nobody knows (and likely, nobody but me cares). 16 races at Bristol have used driver introduction songs so far, starting in the 2009 night race. 516 different songs have been used in total. 339 different artists or musical acts have been used. 100 songs have been used more than once. That’s a 19.4 percent song re-usage rate. For some notable selections, check out Joey Logano, Dale Earnhardt Jr., Denny Hamlin, and Landon Cassill. Now that you’ve sufficiently wasted your time, you’re probably wondering what’s next. Well, you’ll have to tune in Saturday evening for the pre-race ceremonies**** during the Bass Pro Shops NRA Night Race to find out how driver introduction song history is rewritten. Thanks to Jeff Gluck for documenting driver introduction songs over the years. Nice! Thanks to Sim Racing Design for 2009 (Night) data. Thanks to Motor Racing Digest for 2013 (Spring) data. Thanks to Dustin Long/NBC Sports for 2017 (Spring) data. Data from NASCAR.com for 2013 (Night), 2014 (Spring), 2015 (Spring), and 2015 (Night). * There’s nothing investigative about analyzing NASCAR drivers’ introduction songs. The only investigation is to why and how so much time was wasted in assembling this recap. ** The author is not a journalist and this is not journalism by any stretch of the imagination. *** I’m sorry for your poor taste in music. **** Oh, and maybe stick around for the race, too.